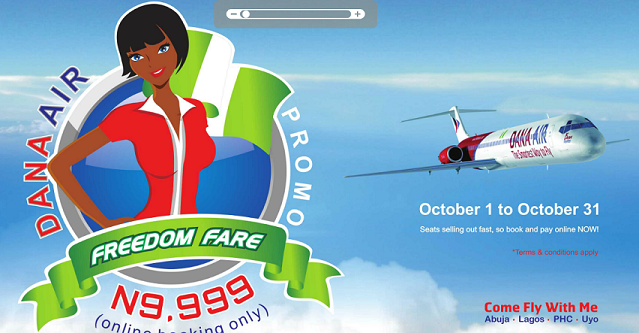 Dana Air seems to be running an “Independence day promotion” on flights between Lagos, Abuja, Port-Harcourt and Uyo. The offer lasts for the whole of October, but you’ll have to book online to take advantage of it. MrPepe did a test booking, and finding the offer on www.flydanaair.com was pretty straightforward. Just enter the flight details for the month of October, and the discounted flight shows up as “Super Saver Economy”…. And you’re good to go!